To my fellow PDM lovers reading this, happy holidays! Hopefully, Santa gave everything you wanted, and you have basked in copious amounts of holiday cheer. Now that presents are unwrapped and the real downtime has begun, let us look back on the year that was. 2016 was a colossal year for PDM. We just splashed up a couple of big Firsts this year – the editorial photoshoot commemorating our 3rd birthday and the Party Doll Manila Events. As the merriest month of the year draws to a close, I want to take this opportunity to say thank you to the amazing people we have met, in one way or another, through PDM. You made this world a better place to be for all celebrations (teehee) and you helped us become the blog and party planning group we are today. One year and eight months in, I feel like I practically know you guys. I have shared quite a bit of your milestones on our blog and have seen your involvement in our social channels. I am humbled and thrilled that you are enjoying our features, and that they have turned into something that has become an everyday read for many of you. We are wonderfully proud of the work we have done and hopefully, we have been able to help you plan the special day of your kids! Stay tuned for next year, 2017 is going to be immense. My favorite time of the year has come and I am just as excited as every kid on Earth is! It’s not just about food and gifts — which are definitely a plus — but the spirit that Christmas brings us every year. I feel so giddy walking at night seeing streets colorfully lit and decorated. It’s extra special celebrating it this year as part of Party Doll Manila and even more so doing it with my closest friends during my free time! Each and every party has been a learning experience for the team, which I will undoubtedly treasure. I’m claiming this year’s and the coming years’ events as a success. Cheers! You do agree that the gift of a family is what truly represents the Christmas season. Besides the wonderful presents, yummy treats, fancy decorations, and festive mood, what make every celebration extra special are the people whom we share our happy moments with. And so, I could never thank Party Doll Manila enough for giving me the early Christmas gift of a warm welcome into their tribe. I can honestly say that with your company, I am enjoying the experience where I find myself happiest and most fulfilled come every party we hold. My gift for you then, is a promise of my commitment and dedication in making every celebration a memorable and successful one. Let us continue making every kid’s dream party come into a reality! But for now, let us give ourselves a treat and be the Santa to our own families, friends, and those whom we hold dear. So long and I wish you a safe and merry Christmas! It’s finally here! It’s that time of the year when we promise ourselves to stick with our diet plans no matter what. It’s also that same time when we forget that promise because temptation is strong especially on that lechon. It’s that time of the year when we go to family reunions and get to know relatives we never expect to exist. It’s that time of the year when we try so hard to wake up early to finish that nine mornings and make a wish and hope it will come true. It’s that time of the year when we grace our taste buds with that perfect puto bumbong and freshly made bibingka. It’s that time of the year when ninongs and ninangs display their impressive hide-and-seek skills. It’s that time of the year when we just want to be with our families and enjoy noche buena together and exchange gifts, kisses, and hugs. It’s that time of the year again. Yes, it’s Christmas time! If you’re anything like us, you’ll know that the magic of Christmas makes everything extra special. There’s the extra awe in our eyes, the added gaiety in our laughter, and more radiance in our smiles. 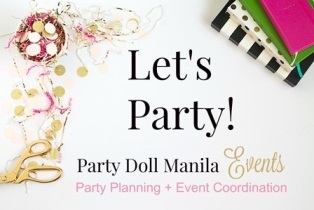 For me, one of the reasons why this year is an extra memorable one is that I became part of Party Doll Manila. And so allow me to thank our contributors for giving me the chance to take a glimpse of your special memories through your wonderful parties. May the joy and love I’ve seen in these celebrations continue on through the years. I am thankful for the opportunity to meet new people, because it also means that I’m given the chance to acquire new learnings. To Ms. Jo-Anne, to the events coord team, to the clients and to the party suppliers and all others: a big thank you! Finally, I would also like to thank our precious readers for inspiring us in our work and for going with us in our journey through the blogosphere. I hope that you enjoy checking out our party features as much as we enjoy writing them for you. I am sure that 2017 will have lots of fun, out-of-the-box and awesome parties in store for us. So, cheers to the fantastic year that was and to the promising year that will be!